Accra, Jan. 20, GNA - Muslims throughout the country on Thursday celebrated Eid-Ul-Adha, the Festival of Sacrifice. The Muslims dressed in colourful clothes, held prayers at mosques and a number of open spots. Eid-ul-Adha commemorates the obedience of the patriarch, Ibrahim to the will of Allah to sacrifice his only son Isma-il. At the Efua Sutherland Children's Park in Accra, hundreds of Al Sunna Muslims prayed and sacrificed a lamb. The Chief Imam, Sheikh Ibrahim Imoro, urged Muslims to uphold the virtues of righteousness, saying "there can be no real righteousness in the absence of truthfulness". "As humans, we have a common duty to serve Allah...we should not forget to pray and help people who are in need." Sheikh Imoro advised the Al Sunna Muslims against falsehood, which he said led to sinfulness and hell. 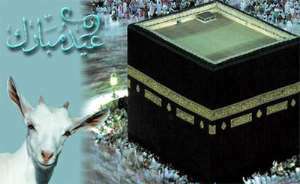 He performed the sacrifice of the ram which he said symbolized complete and unconditional surrender to the will of Allah. "It is a great event to be remembered and commemorated by Muslims all over the world." Delivering the sermon at Ashongman, Maulvi Wahab Adam, Ameer and Missionary-In-Charge of the Ahmadiya Muslim Mission, Ghana, asked Ghanaians to make unstained sacrifices to ensure that the dream of building a prosperous nation became a reality. He said while Ghanaians had the right to congratulate themselves for peaceful elections, they must also realize that elections imposed on the citizenry an additional responsibility of sacrifice for the country. "Elections are only part of a long and arduous democratic process, a means to an end and not an end in itself. Without sacrifice our dream of building a progressive, happy and prosperous society for ourselves and posterity will be a mirage," Maulvi Adam said. He said the festival underscored the crucial need for sacrifice in nation building. Maulvi Adam said Ghana needed to take a cue from countries that had made it to the top not through easy lifestyle and lip service declarations but through sacrifice and hard work. "Both high profile officials of Government and the ordinary man and woman on the street should therefore brace themselves up for sincere sacrifice today in the service of Mother Ghana in order to reap the dividend tomorrow." Maulvi Adam tasked Ghanaians to avoid ethnicity, saying that it undermined cooperation and love, which were crucial for peaceful coexistence. There were prayers for the unity, peace, harmony and prosperity of Ghana as well as the Asia tsunami and other disaster victims in the world.